Printers use CMYK as their colour model. CMKY is an abbreviation derived from the four colours: Cyan, Magenta, Yellow and Key (Black). 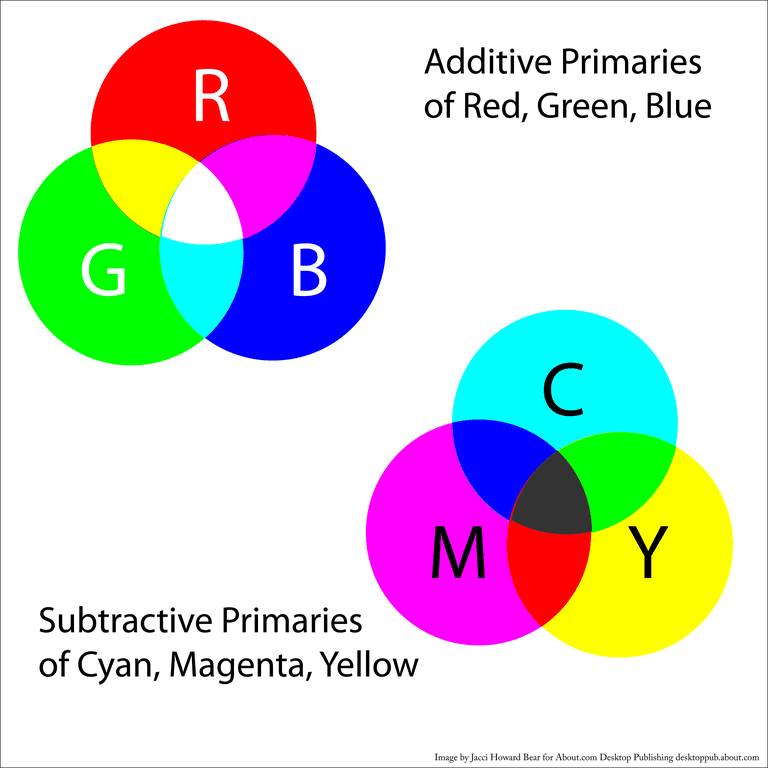 So cyan, yellow and magenta are called the subtractive primaries (CMY), and adding them together gives black. In the CMYK model, colours are added so that the right wavelength of light is reflected by the image. CMYK printing is also called the colour separation or four-colour-process. The colours are individually applied, starting with black, and then the rest of the process colours are applied in the order- cyan, magenta and yellow. In both offset and flexography the popular printing methods, each colours is applied or printed one at a time to produce the desired end colour. Digital images are in RGB, and have to be converted to CMYK through software to make separate plates to produce prints. A print overlay is prepared for each colour, and is used to make the plate, which is linked to ist colour in the press. Ink is added to the packaging surface by the image areas in each plate, and rejected in non-image areas. The individual plates add each colour as tiny dots in such a way that in the end they together produce the desired colour in the design. This 4-colour-process has been improved gradually, and the number of pigments used has been increased by a process called halftoning, where different intensities of the four colours are used. The 6-colour-process uses CMYK and the diluted pigments of cyan (LC) and magenta (LM). Similarly, the 8-colour-process, uses CMYK and the diluted form of all the four colours- LC, LM, LY and LK. This has increased the number of colour combinations possible, besides making the print quality more rich in details, vivid, less grainy, and crisp. The colour separation method can produce up to 16,000 colours, depending on the material being printed and the printing machine used. Yet, this is less than the millions of colours the human eye can detect. Therefore, discuss the various possibilities with your printer. In 1994 a single –grip metal decorating press was developed based on the offset printing machines for paper. This can print on flat and rolling materials, and is suitable for printing metal as well as paper and plastic labels. Possibility of digital linkage to a pre-press or the Computer-to-Plate step. Print quality that is measured and controlled by using densitometry and colorimetry. Control of ink thickness by the Densitometry, as well as control by colorimetry of the individual colours used to produce the desired final colours. So a person qualified in colour management is vital to the whole process. Flexography is based on the letterpress method of printing. It is similar to offset printing in that an image is prepared on a plate initially. Flexography transfers the print directly to the surface being printed, while in case of offsetting the image is transferred to an intermediary medium like rubber. Flexography is suitable for flexible material that can move over rollers to be printed. It is one of the fastest and most versatile of all printing methods. Produces excellent print quality and a single printing plate can be used for several runs. A wider range of ink types and colours can be used here than in offset printing. Based on the method used to dry inks, there are water-based and UV inks. Water-based Inks: Water-based inks which are dried through thermal means are suitable for all metal types. They have the advantage of being lower in cost than UV inks, and more environmentally friendly than solvent based inks. UV inks: Both offset and flexography methods use UV inks, where special types of inks are dried through UV radiation. The combination of using UV inks in flexography printing is mostly used for printing packaging and labels. UV inks can transfer to the inner side of neighbouring sheets when they are stored, and could lead to contamination. So UV inks devoid of toxic materials are used, and applied prior to internal coatings to prevent any kind of contamination. Labels and prints these days are a far cry from those produced 80 years ago. It is possible to get near perfect prints mirroring real life images on metal packaging, with the technology and colours available, leading to better customer satisfaction.